When visiting Newport, it seems like everyone is looking for the best seafood around. 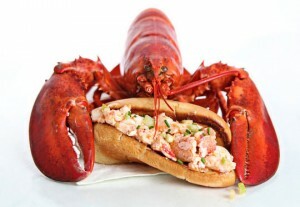 Lobster and the delicious lobster rolls they become, are usually a crowd favorite. Well, guests at the Marshall Slocum Inn have to look no further than our very own kitchen to find a great tasting lobster roll. The Lobster Roll Boxed Lunch for Two includes two freshly made lobster rolls, kettle potato chips, chocolate chip cookies and water for $38.00 per couple. Place your order at our Concierge Desk by 10am and have your lunch ready to enjoy during a break in your walk along Cliff Walk, along the water on Ocean Drive, or even on the back porch of the Inn!